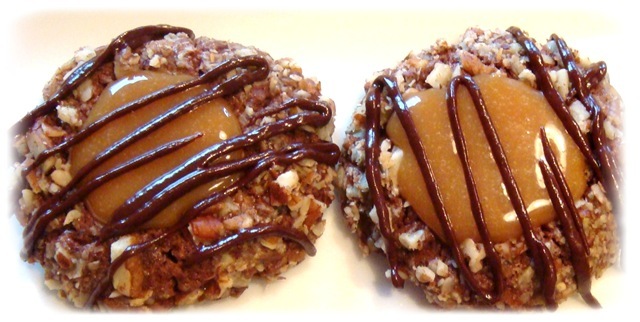 DAY 11: These Chocolate Caramel Thumbprint Cookies combine three great tastes: chocolate, caramel and pecans. They look complicated, but are actually pretty easy to put together. I like to use a dark chocolate drizzle, but you could use regular semi-sweet chocolate chips or even milk chocolate chips for a less-intense flavor. Combine butter, sugar, egg yolks, milk and vanilla in a mixing bowl. Beat until light and fluffy. Add flour, cocoa powder and salt. Beat until well combined. Refrigerate dough for 1 hour. Preheat oven to 350°F. Place egg whites in a small bowl. Place finely chopped pecans in a bowl. Set aside. Roll dough into balls. Dip balls into egg white and then into pecans. (I find this easier if I make a whole baking sheet worth of dough balls, then dip them all in egg/pecans). Place on a parchment paper lined baking sheet. Make a small indentation with your thumb in the center of each cookie. To prepare Caramel Sauce: Combine caramels and cream in a small saucepan. Cook over low heat until caramels are melted. 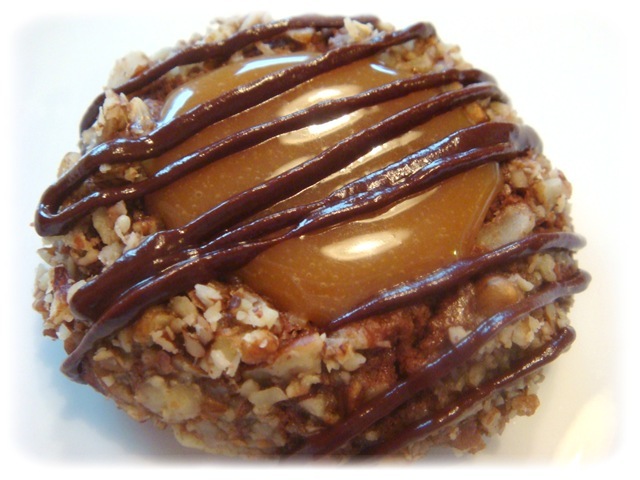 Spoon small amount of caramel into centers of baked cookies. Carefully remove cookies to a wire rack to cool. For Chocolate Glaze: Combine bittersweet chips, butter and corn syrup in a small bowl. Microwave for 30 seconds. Stir. Microwave for another 20-30 seconds if not melted. Let cool slightly. Pour chocolate into a small Ziploc freezer bag (don’t use a regular bag-it WILL burst). Poke a hole in the corner of the bag (a bamboo skewer makes a perfect sized hole). Drizzle chocolate over the cooled cookies. Cool until set. This is beautiful. I am loving your 12 days of cookies. I googled “Christmas cookies caramel” and stumbled upon this recipe. It looks DELICIOUS! I plan on making it tomorrow night. Thanks for sharing! They are definitely a favorite around here. Merry Christmas! I made these today and they are every bit as delicious as they look!